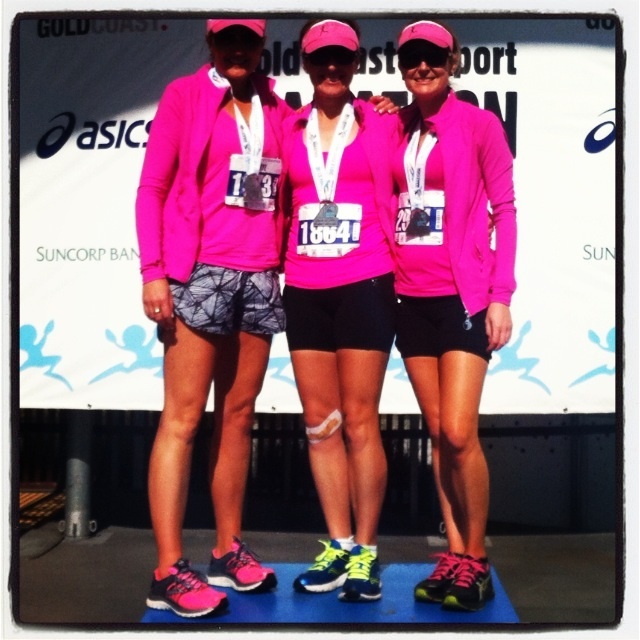 Last Sunday, 7th July 2013, was the 35th running of the Gold Coast Airport Marathon. I had been excited for some time to be doing this event. Most people that I spoke to who had experienced it first hand said that it was a well-run, well supported event, and a great course. A few people has said that the course was flat and boring, but after my 2 recent ultramarathons in the Blue Mountains, flat sounded pretty good. 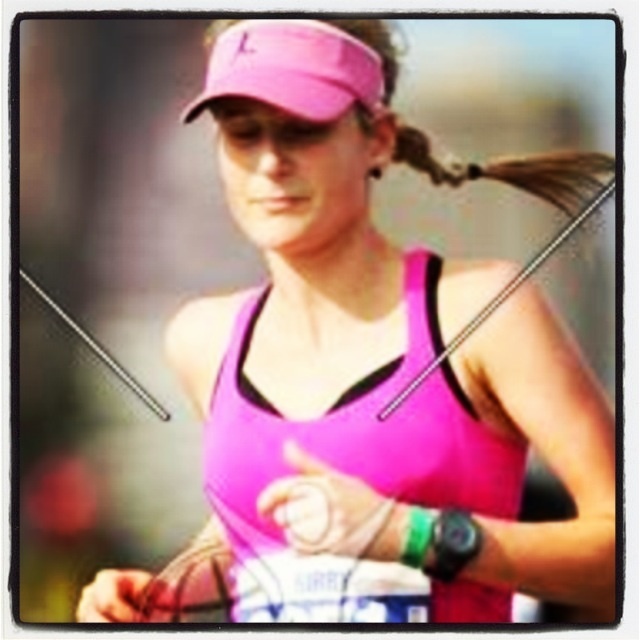 5 days out from the marathon, I awoke with a raging sore throat, cough, aches and pains. Noooo, I can’t get sick now. On the (hesitant) advice from my Dad (who would have preferred I just pulled out altogether) I went to the chemist for the strongest bottle of cough medicine that I could buy without a prescription, and consumed my daily limit of codral and panadol for the next 4 days. On Friday, Kellie and I left Newcastle at 6am bound for the Gold Coast. It was a long drive, and we arrived at around 5.30. We checked into our hotel, and decided to head out for a short 5k jog around Surfers Paradise, to shake out the legs that had been sitting in the car all day. It was my first run in 3 days, and I was a little worried to find just how short of breath I felt after only a couple of kilometres. On Saturday morning we decided to check out Varsity Lakes Parkrun, for another 5k jog, our last before race day. We ran it in around 28 minutes, and again I was worried about how short of breath I felt, and how tender my right calf was. After parkrun, we met up with Helen and headed to the race expo to pick up our race packages. We also made some last-minute purchases, such as gels, a SPI belt and water belts. The rest of the day was spent eating, packing our bags for race day, painting nails and undergoing other pre-race rituals. We set our alarms for 4.30am and got an early night. Race day began like any other, breakfast biscuits, bananas and peanut butter on toast. In a break with tradition, I decided not to wear my pink compression calf sleeves, worried I would be too hot. Kellie and I caught the free bus to the start line, where we found Helen, Cheryl and Jodie. We checked in our bags for after the race, and headed to the start line. Helen and I were in the A start group. We took our places in the start chute, ahead of the 3 hour 30 pacer, who was wearing a pink wig. The anthem played, the starting gun sounded, and we slowly started to shuffle forward. It had begun. We completed our first kilometre in 5 minutes 4 seconds. Pretty good, considering the congestion. “Well that was easy”, I said to Helen. “Now let’s just do that 41 more times”. Originally, my plan for this marathon was to run it with Helen, and get a good time. But after getting sick this week, my plan became to hold on as long as I could. 15km in, things were going to plan. We had passed Helen’s family on the sidelines, and the lead pack, heading back in the other direction. Helen cheered them on, clearly in good spirits. The road was narrow, and we were running in front of the 3:30 pace group, so it was crowded. We turned together at 15.6km, and had been running consistently at around 4:50 kilometres. But I struggled to get into a nice rhythm, always surging and then slowing down, weaving through the crowd to keep up with Helen. It seemed that every time I tried to call out to somebody that I was trying to come through, they were wearing headphones and couldn’t hear me. I passed my friend LJ who was spectating, which was a nice lift, but I was fading fast. At around the halfway point, Helen began to slip away. Because I had been sick, I had been drinking a lot of water from my water belt. And because it was so congested on the course, I had avoided the water stations. I was running out of water. It was time for gel #2, cherry lime, my favourite. But I did something I never do, and downed the whole gel in one go, followed by some water from the next water station. Bad idea. The gel didn’t stay down for long. I passed Cheryl and Vlad, who were spectating, but I wasn’t feeling good. I felt like I was hitting the wall early. My calf was feeling fuzzy, and my energy was completely zapped. It was hot. I desperately wanted to stop and walk. But once I start walking, I find it hard to start running again. With 20km to go, that would be a 4 hour walk. I did not want this to be my first 6 hour marthon. So I told myself, slow down to 6-minute kilometres if you have to…. Just keep running. It was disappointing when the 3:30 pacer passed me, but I kept going. I knew Kellie was only a few minutes behind me. I considered slowing down so she could catch me, and running together. but I was worried that if I slowed too much, I would not be able to gain momentum again. I topped up my water at the next station, had another gel (slowly this time) and got into a rhythm. At around the 30km mark, where most people start to struggle and fall apart, I felt good again. i was running consistently at around 5:10- 5:15 kilometres, and headed for the final turnaround. 500m from the turnaround i saw Helen headed for home and looking strong. As I turned the cone myself, I met a nasty headwind. The last 5.5km were tough. I passed Kellie travelling to the turnaround, who must have been on track for a PB. What a day! What a great event. I loved the flat course and the support from the crowd. I am slightly disappointed that I was not feeling 100%, as the course had definite PB potential. 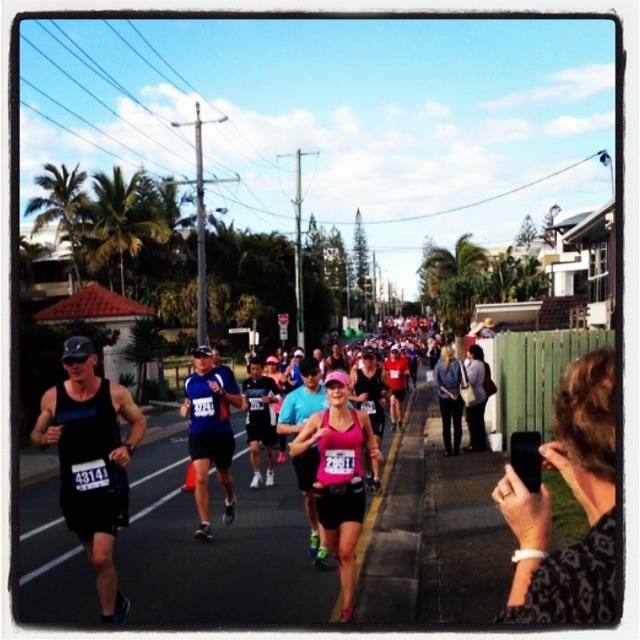 I get the feeling that the Gold Coast Marathon is gunning to be Australia’s premier running event, and I probably would not begrudge it of that title. Well done Gold Coast, and Thankyou volunteers. Special cocngratulations to Kellie for running a PB, and Helen for crossing in a fantastic debut marathon time of 3:31:00. Helen and I are friends, because we have lots in common…… and, because we are in different age groups. i’m not looking forward to the day we are both 70+, and have to line up against each other. Both the men’s and women’s record books were rewritten. 2:10:01 is the new men’s time to beat, while if you’re a lady, you’re now looking at 2:27:17 if you want to break the course record. 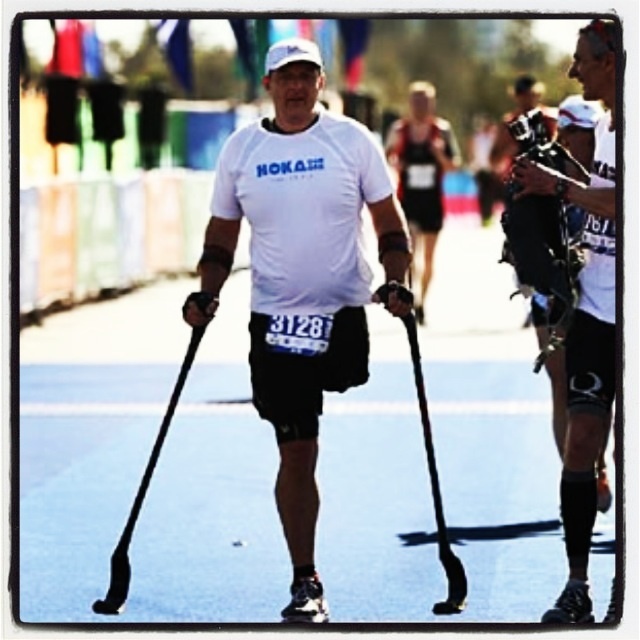 6-time gold medallist Paralympian Michael Milton broke the world record for completing a marathon on crutches, in 5 hours 28 minutes 59 seconds. And I thought my feet were sore at the end… Imagine his hands! The last person to cross the finish line was Daryl Howe, in a time of 6:55:45. 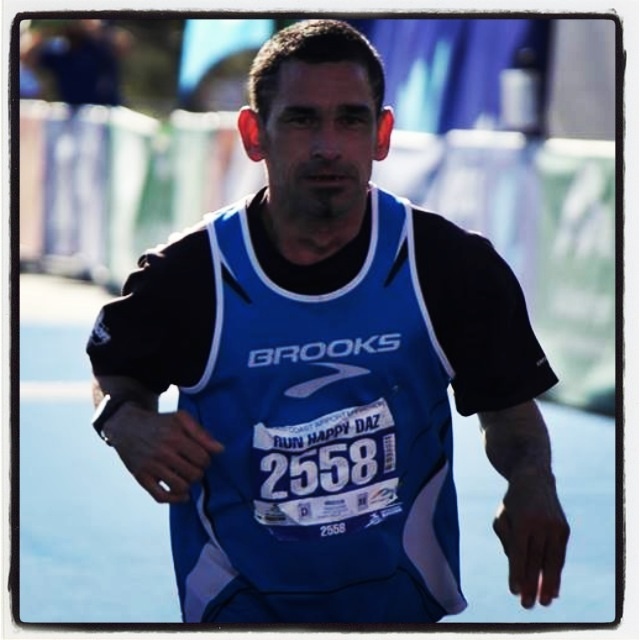 Daryl has Cerebral Palsy, and this was his 17th marathon. Truly amazing and inspirational. Congratulations to all runners, especially those who made their debut, and those who got PB’s. So proud to share the day with you! Fair dinkum!! You journalists – always misquoting people or taking things out of context!!! Yes, I did say to go to the chemist and get the strongest bottle of cough mixture available over the counter, and I guess it worked, didn’t it!!! No, I didn’t prefer you pulled out of the event. I didn’t want you to push yourself too hard given you’d been sick with the result of ending up even sicker. Pleased you were able to complete in a time which I feel was very good given the health circumstances. Yes, i’ll probably be your handler / support for Hunter Marathon on 21 July. Prepare well! ← Please Don’t Underestimate Me!